Starring: Natalie Dormer, Taylor Kinney, Yukiyoshi Ozawa, and more. I have a habit of starting the new year with a horror movie. I do not know if it is just a coincidence or if it is fate that I see a terrible movie before all the star power comes out during the year but regardless, it seems to be the trend. As a new year begins, we have now passed the first weekend of 2016 movie releases and with the releases came the expanded release of ‘The Revenant’ and the supernatural horror, ‘The Forest’. 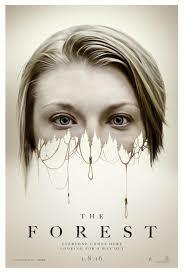 The story of ‘The Forest’ begins with Sara Price (Natalie Dormer), a seemingly wealthy female who has a notion that her identical twin sister is in trouble one night when she awakes to a strange dream. Trusting her connection to her sister, she books a flight to Japan to find her sister, Jess (Also played by Natalie Dormer), and begins to search for information as to where exactly she went besides the previously known knowledge that she went on a trip into a dangerous forest known as the suicide forest (Truly known as the Aokigahara Forest). As she searches for her sister she travels to her known locations that she knows her sister has been to or could possibly have traveled to and among those locations she meets a journalist named Aiden (Taylor Kinney) who decides to help her search for her sister as she travels into the forest and also recruits the help of a local navigator, Michi (Yukiyoshi Ozawa). As the group travels into the forest they begin to experience the strange occurrences they are warned of and the search for Sara’s troubled sister begins to be much more difficult than already set out to be. I am a tough critic when it comes to horror movies, so by the end of this opinion section I am going to be as neutral as possible but in the meantime, allow me to tear this movie apart *clears throat*. Yet another unoriginal, non-frightening, cliche horror movie brought to you by the genre of what I like to call “Hollywood Horror”. People, you have seen this stuff before. I want to name all the movies that this reminded me of but all of their names are mixing together just like their plots and their attempts to scare crowds. The movies I am thinking of probably start with the word “The”… Oh wait, this movie started with the word “The”… Do you see where I am coming from? Anyway… ‘The Forest’ has been done before, the plots have been done before, the acting has been (horribly) done before. You see one, you see them all, and you SURELY could do without seeing them all again. Now for the neutral part… Okay, I am hard on these horror movies but I do not get scared easy nor am I amused much by these films. I find myself laughing most of the time but I know many others who find these films entertaining and actually do get frightened at some of the jump scares (Shout out to my girlfriend who I am directing this at. I still love you even though the movie was not that good in my opinion. <3) The film is great for date night and if you are trying to get out and are in the mood to catch another typical horror movie. Do not get invested in the thought of being blown away because you will be utterly disappointed. Go in expecting just a good time with company and a personally entertaining experience. Whoops… Sorry… I accidentally put a GIF of a good movie that takes place in a forest called ‘The Revenant’ which you should totally see. In the meantime, let me fix this…. There we go… Spooky ghosties.